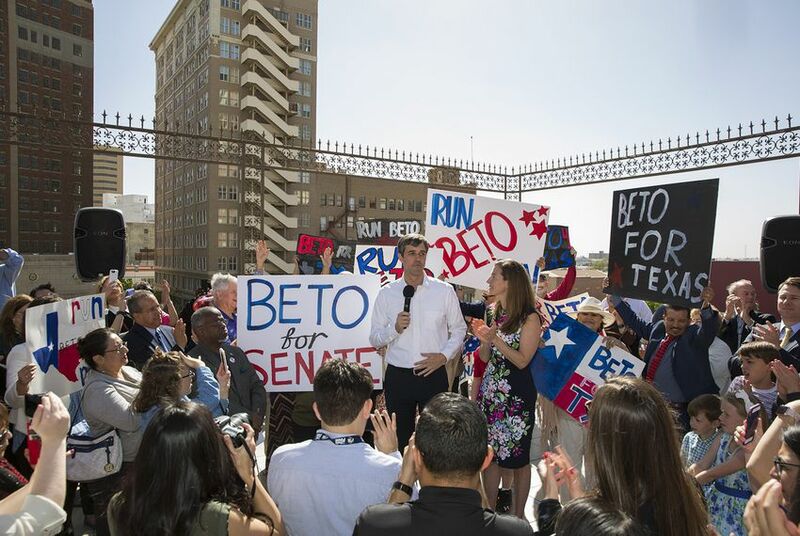 In his bid to take down U.S. Sen. Ted Cruz, Democratic U.S. Rep. Beto O'Rourke has visited 226 of Texas' 254 counties, won glowing coverage from the national media and raised nearly $9 million. His Democratic primary opponents mostly campaigned on social media and reported raising less than $10,000 combined. But as the votes rolled in Tuesday night, O'Rourke's win wasn't as massive as traditional indicators might have suggested. O'Rourke won less than two-thirds of the statewide vote. Sema Hernandez, a 32-year-old Houston activist and self-described “Berniecrat,” picked up a surprising 24 percent. And she trounced O'Rourke in several key border counties with large Hispanic populations. It’s an outcome that’s not uncommon in statewide Democratic primaries in which, experts say, Hispanic-sounding surnames go a long way with Hispanic voters when name recognition among primary candidates is low. In 2014, Wendy Davis, the Democratic gubernatorial candidate, won the statewide nomination handily but lost several border counties to Ray Madrigal, a candidate with no statewide name recognition who spent virtually no money on his campaign. It was the same case with former Gov. Ann Richards' 1994 re-election bid, when she faced Gary Espinosa in the Democratic primary. Richards won that race handily with 78 percent of the vote. But her margins of victory were significantly lower in several border counties, a trend experts attributed to the Hispanic surname of her comparatively little-known opponent. “Virtually every time someone has run against a Latino surname for U.S. Senate or for governor in the past two decades, that person [with the Latino surname] has received about 20 percent of the vote,” said Manny Garcia, deputy executive director of the Texas Democratic Party. O’Rourke did pick up two key counties in the Rio Grande Valley — Hidalgo and Cameron — and he won 90 percent of the vote in El Paso, his home county on the border. He attributed Tuesday night’s results to his campaign’s whole-state approach. O’Rourke acknowledged that the campaign has work to do in voter outreach. He said he'll continue to work on that, with efforts that will include Spanish-language campaign events and media hits. He also said he wasn’t sure what role his surname played in his performance Tuesday. But several experts pointed to it as the main factor behind his loss to Hernandez in certain border counties. In low-information Democratic primaries, name matters when voters are choosing a candidate based on cues like gender and surname, said Victoria De Francesco Soto, a political science lecturer at the University of Texas at Austin who has studied Hispanic voters. Those cues might also have played a role in the crowded Democratic race for governor. Former Dallas County Sheriff Lupe Valdez led her race, besting Andrew White with 43 percent of the vote to his 27 percent. But her share of the vote was even higher in the same border counties where O’Rourke faltered. In Webb County, for example, she won 59 percent to White’s 10 percent. Unlike his Republican opponent Cruz, O’Rourke is still relatively unknown in Texas. A congressman from El Paso, he’s never run a statewide campaign and now faces the tough and expensive task of introducing himself to voters across the state. Similarly, Davis’ 2014 performance on the border served as fuel for Republicans, including her Republican opponent Greg Abbott and his supporters, who quickly jumped on Davis’ losses in left-leaning South Texas to argue the border counties had rejected her candidacy as too liberal. To be sure, Cruz is still the favorite in November. But political observers and Democrats say O’Rourke has plenty of time to make up for his lack of name ID in these areas, which serve as Democratic strongholds in the general election. Garcia, the Democratic Party leader, nodded to O’Rourke’s willingness to crisscross the state to introduce himself to voters. Disclosure: The University of Texas at Austin and the University of Houston have been financial supporters of The Texas Tribune, a nonprofit, nonpartisan news organization that is funded in part by donations from members, foundations and corporate sponsors. Financial supporters play no role in the Tribune's journalism. Find a complete list of them here.